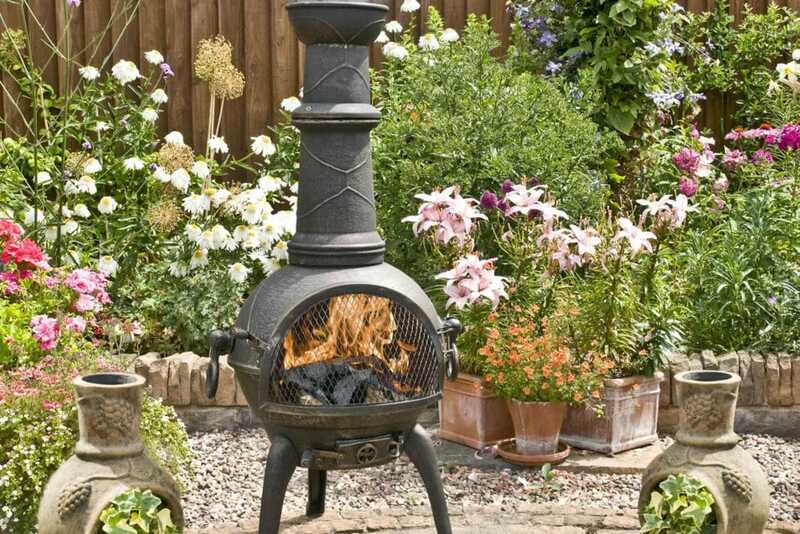 Best Chiminea Reviews UK 2019 - What Is It? How Do We Use It? 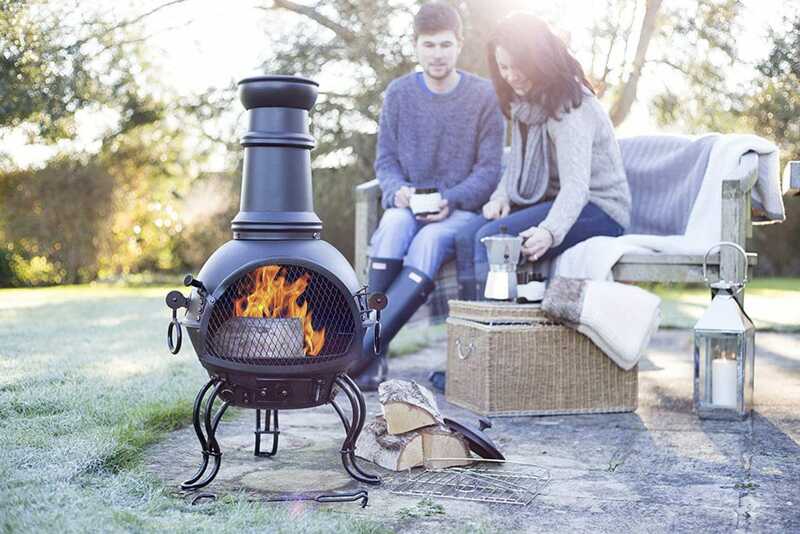 If you love spending time outside in your garden, then finding the best chiminea for you and your family would be a perfect way to stay cosy on cooler evenings. 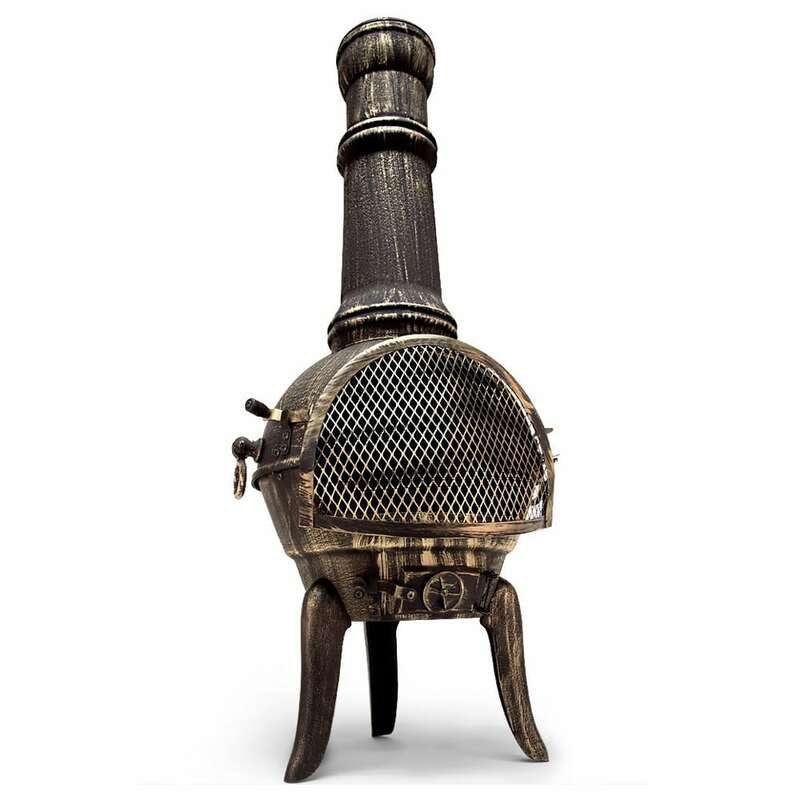 These wood-burning stoves have been used for centuries to cook food and to keep people warm. Traditionally crafted only from clay, they are now available in a multitude of materials and a huge variety of attractive designs. A chiminea truly is a great addition to any outdoor space; creating a beautiful, fiery centrepiece for entertaining and BBQing with loved ones late into the night. But how do you know which model is right for you? With so many options on the market, it can certainly be tough to decide which one is right for your particular needs and circumstances. Don’t panic! We have done all the research for you. Below is our roundup of the 10 most popular chimineas – so you can choose the best chiminea for your garden! 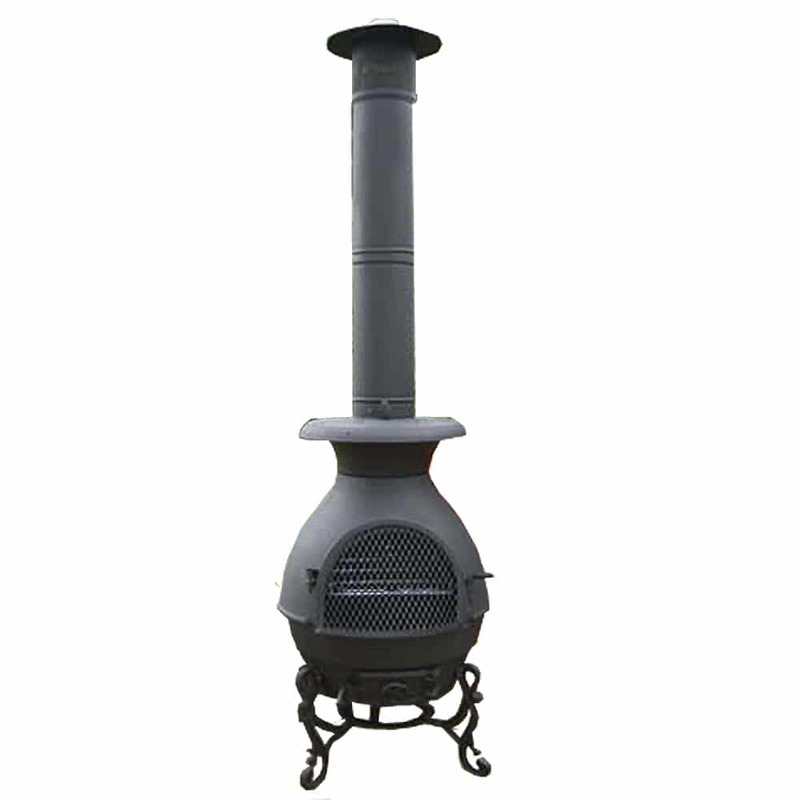 This stylish looking, solid cast iron chiminea is our number one pick. It may not be the largest on our list, but it kicks out a good amount of heat so you and a couple of your friends will be perfectly cosy on an autumn evening. The included griddle is great for a small family BBQ, so you can enjoy some delicious hot food without having to head indoors. And once the fire starts to die down, it retains heat for quite some time – so you can relax beside it a little longer as the evening comes to a close. What’s more, when the party’s over, the Sierra is super-easy to clean. A separate ash section is accessed by a small door in the front, so you can simply empty it out without any fuss. You can burn both coal and logs, but you should be aware that smoke may escape from the front if you overfill it. While this chiminea is sturdy and durable, like all metal it is prone to rust. Therefore, you should consider buying a cover or storing it inside to prolong its life. 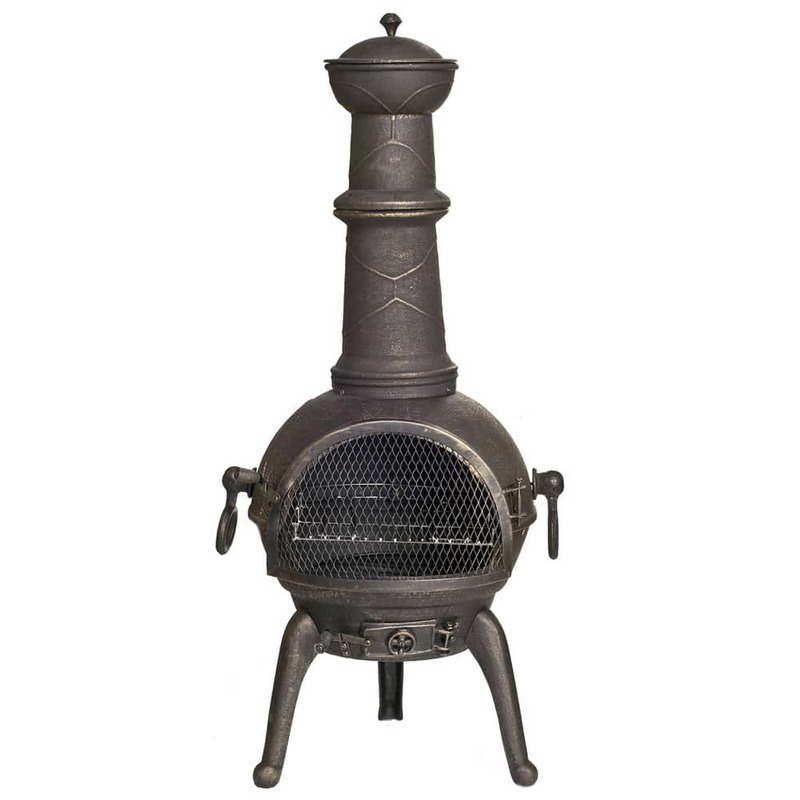 This rustic style chiminea is our favourite cast iron chiminea. You can use it to BBQ small items thanks to its removable grill, which comes complete with a hook handle made of wood for safe removal and installation. There is also a separate ash compartment with its own door for easy cleaning. Its solid construction heats continuously for a long time after the last embers have died down. This, combined with its big fire pit and cool rustic design makes it a great focal point for your garden party. Keeping the fire burning perfectly is easy too, thanks to its large mesh-covered front area which allows you to easily see when you’re getting low on fuel. On the downside, the door catch can be a bit flimsy and you may need to replace it further down the line. Also, as it is made of solid cast iron, some rusting is to be expected. Therefore, if you’re planning to store it outside, we would recommend that you purchase a protective cover. Lastly, compared to other models, the assembly instructions were not easy to understand and many people complained that the diagrams lacked clarity. So if DIY is not your forte, you might be better off looking at another one of our easier to assemble recommendations. This sleek and modern chiminea features a contemporary design and is perfect for heating a large area on those cooler evenings. 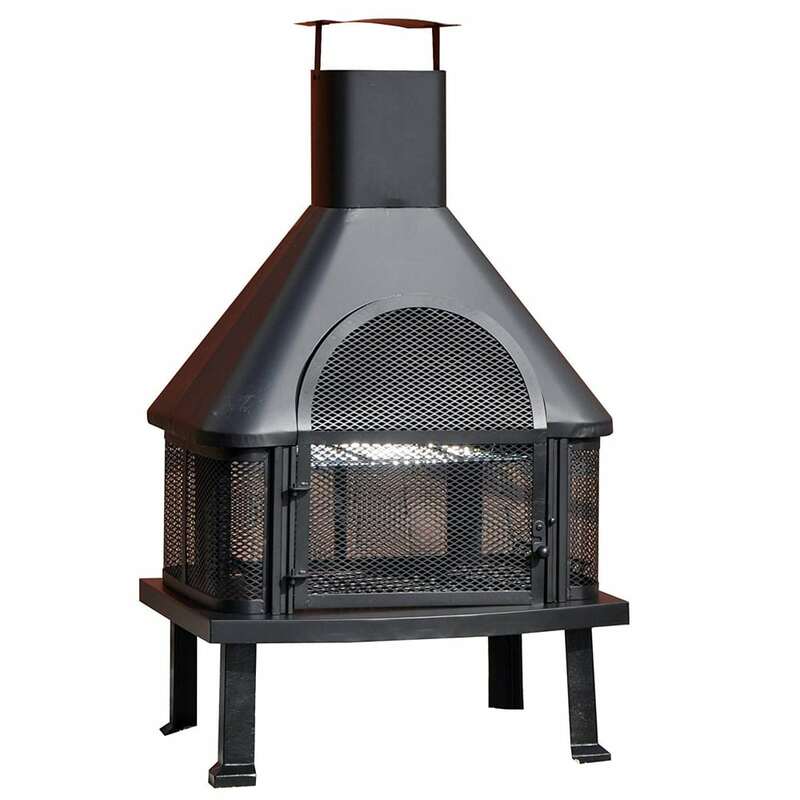 Its extra-large size means that all of your guests will stay warm as you chat around the fire, and the tall chimney ensures that the smoke is emitted high above head height. We’d recommend purchasing this chiminea if you like to have huge garden parties or if you have a big family. However, as there is no fire guard, this particular model may not be a great choice if you have small children around. That said, even when it’s not lit, its beautiful shape means it will stand out as a statement piece in your outdoor entertaining area. Unfortunately, it doesn’t come with a BBQ grill. So, if you’re looking for a multipurpose chiminea, check out some of the others on our list – this one is purely for warmth, light and looks! This chiminea by Azuma is our pick for warming gardens, although its timeless good looks will enhance any outdoor entertaining area. For a small chiminea, this model gives off a lot of all-round heat thanks to its impressive open-mesh fire bowl. This is perfect if you are having a family gathering as the heat is released from all sides to keep everyone warm. It’s constructed from cast iron, so it is tough and durable enough to last you many years. A steel chimney lid, charcoal grate, and poker are included which will come in handy during use and cleaning. This is also simple to assemble, even though some users did complain it was a little on the fiddly side. Unfortunately, the Azuma isn’t suitable for cooking – so you’ll need to use a separate BBQ or buy another model from our list. 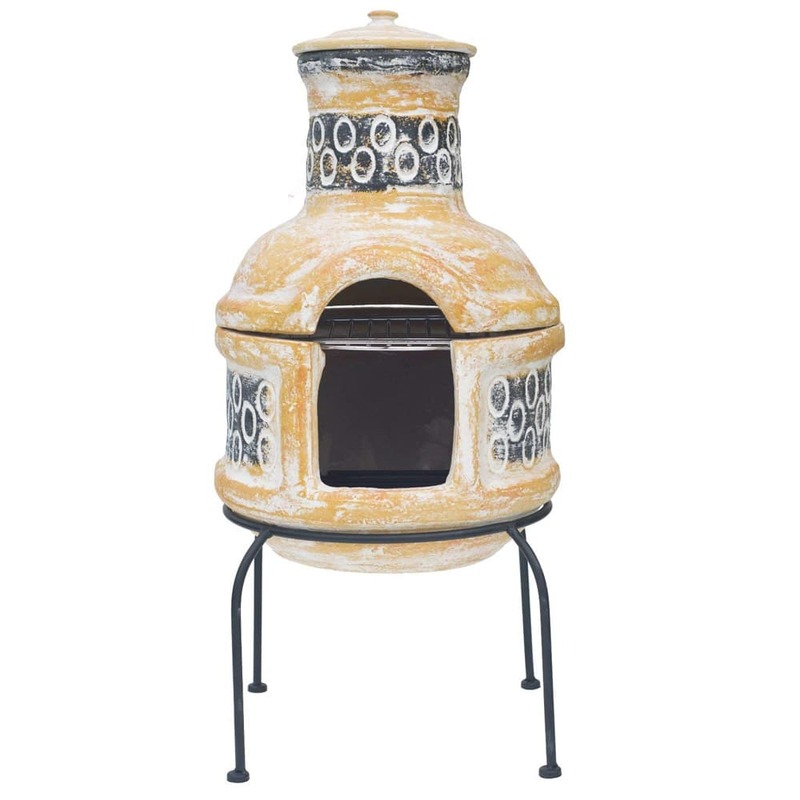 This BBQ chiminea from Kingfisher is great for when you want to combine outdoor cooking and staying warm. 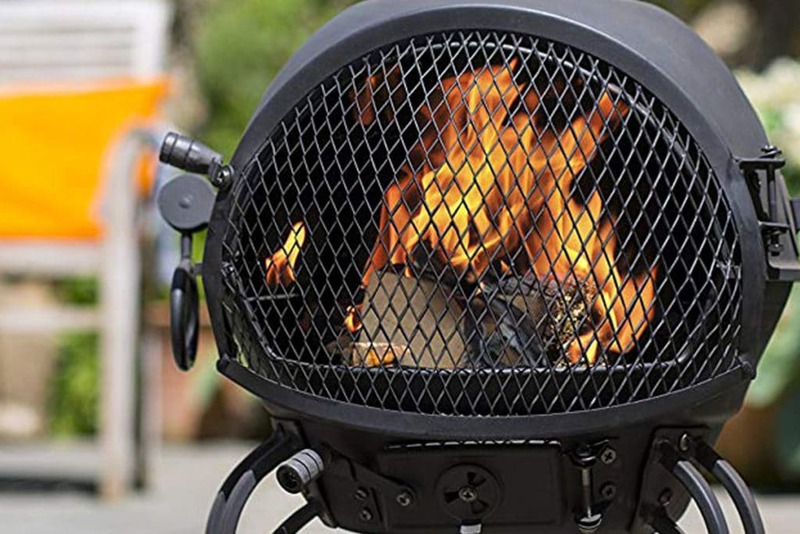 Big enough to compete with your standard sized BBQ, this handsome, rectangular chiminea is an excellent choice if you have a huge garden and like to entertain regularly. Thanks to its size, you can burn medium-sized logs or charcoal. It comes complete with a cooking grill, removable ashtray and a BBQ tool made of wood, so you’ll have pretty much everything you need to get started, except for fuel. The amount of heat given out by this chiminea is impressive. Thanks to its large size and 360-degree protective black-mesh spark guard, it will keep you and your guests warm well into the night. This particular model is also very easy to assemble so you shouldn’t find yourself struggling for hours to get it put together. Overall, this is a fantastic choice, but there are a few negative points to mention. To start with, many users weren’t overly thrilled with the quality of the mesh itself, complaining that it bent out of shape easily. Additionally, it can be difficult to find an appropriately sized cover for this chiminea due to its size, so you may struggle to keep it clean out of season. 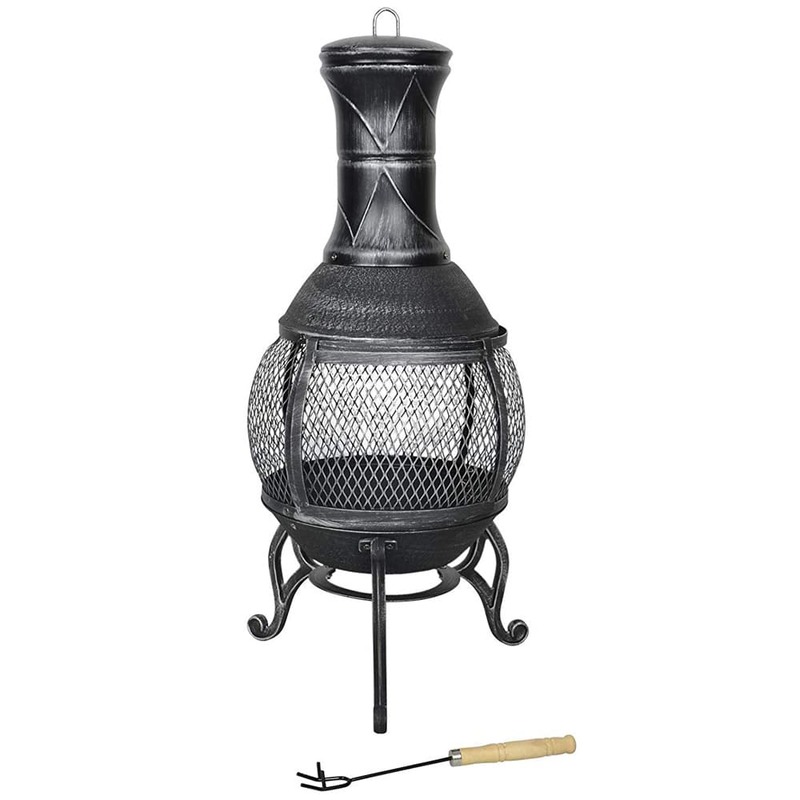 This traditional looking, ‘pot belly’ style chiminea will keep you warm and is our favourite grill option. The included BBQ grill is height-adjustable, so you can have complete control over how quickly your food cooks. This makes it perfect if you have under or overstocked the fire, as you can simply move it higher or lower to match. The heat given off is substantial, and because it is crafted from cast iron, it heats continuously even after the last embers have died down. This means you and your family or friends can stay warm in the garden for longer than expected. The Castmaster Pasadena is extremely durable and should last you for many years – although you will need to purchase a cover if you’re not storing it indoors. We’d also recommend treating it with protective paint if you don’t want it rusting over. We like how this tall chiminea exhausts smoke high above your guests’ heads. However, a few users complained that some sections didn’t fit together as well as they could have. Similarly, you may find the instructions difficult to make sense of, as a few people found them to be frustrating to follow. Therefore, if DIY is not your thing you may struggle to assemble this product. If you’re looking for a traditional clay chiminea which can also double as a BBQ, then this La Hacienda Clay could be a perfect choice for you. Boasting beautiful rustic looks which provide a certain ethnic charm, it can be used as both a patio heater and a BBQ; making it a great multipurpose option for small outdoor entertaining areas. 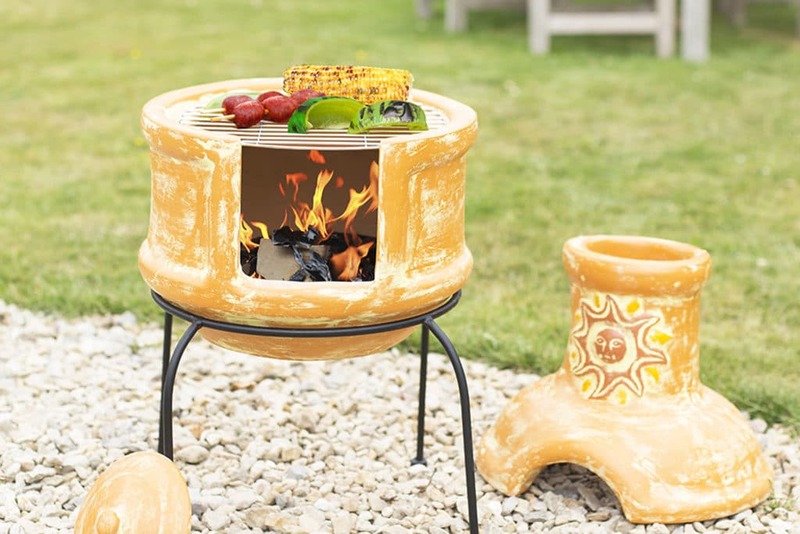 This ceramic chiminea comes complete with a four-legged stand, a grill, grate and chimney lid. Unlike other models we have seen, it requires no assembly. Simply place it upon the stand where you would like and it is ready to go! Please note that clay chimineas are notorious for cracking, so you will need to take care to ‘season’ it before use. Using it properly entails putting sand and having several small fires prior to its first use. Doing so should help prevent it from cracking. However, many users fell foul of this even though they attempted to season the chiminea according to instructions. Furthermore, as clay ones will likely crack in freezing conditions, they may not be right for you if you don’t have sufficient space to store it during icy weather. 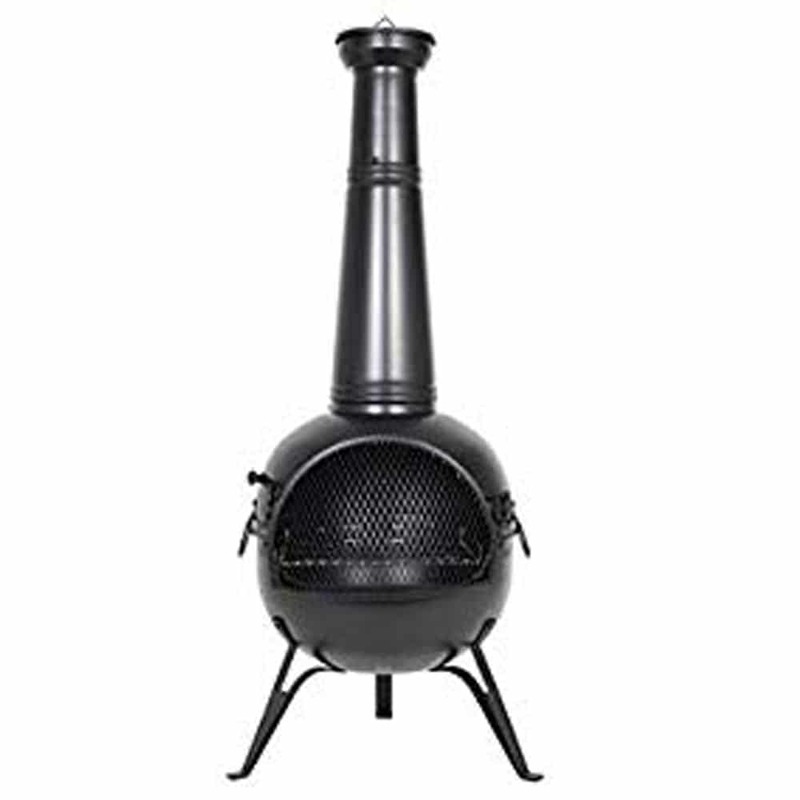 This is a good looking, distinctive chiminea that is great for small BBQs. However, if you’re unable to put in the time and effort required to ‘season’ it at the beginning, and cannot store it properly in cold conditions, then you’ll be better off choosing one made from a different material instead. This steel chiminea is a good choice if you’re looking for a high-quality, lightweight option which can be easily moved into storage over the winter. It heats very well and its spark-guard mesh door can protect you against accidents. This chiminea also doubles as a BBQ and comes with a removable grill pan, as well as a grilling tool and chimney lid to help you get the fire started. 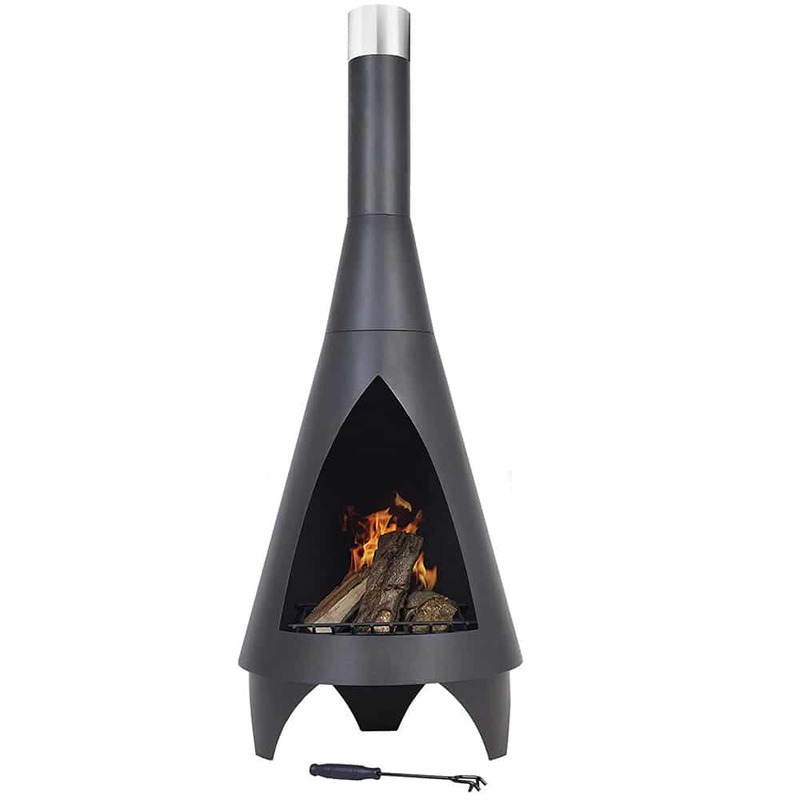 We found this was a good size for small to medium gatherings, and we particularly liked the chimney height which enables you to get warm and cosy without getting a face full of smoke. Unfortunately, many users weren’t happy with the heat-resistant paint, complaining that it started to peel after the first use. So you may find yourself having to repaint it if you’d like to keep it looking like new. Some people also found it was awkward to put together and the parts didn’t always fit as expected. This steel model is a great option if you have a smaller outdoor living space. Small but perfectly formed, this handy little chiminea comes with a removable grill and an outdoor cover to help protect it from the elements. While it gives off a decent amount of heat, if you would also like to use it as a BBQ, we recommend it be used by couples rather than big groups. If you’re just snuggling up close to stay warm, the sturdy mesh door will protect you against sparks while giving off a radiant glow. 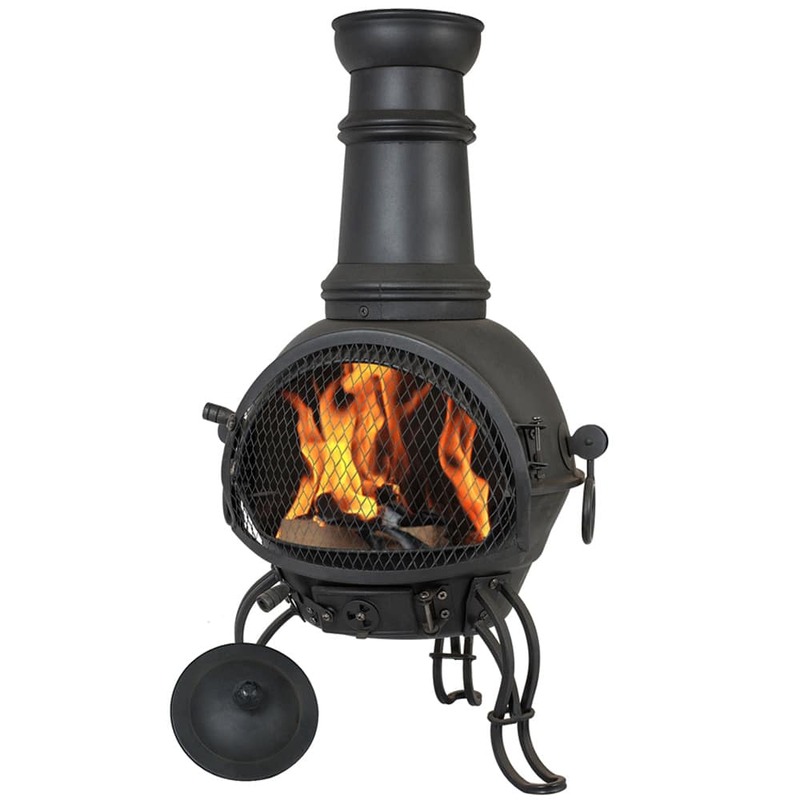 This cute chiminea will make a good, durable purchase. However, if you enjoy entertaining a lot of people, you may find its size a little restrictive. It arrives flat packed and is easy to assemble, but even so, many people found it quite time-consuming to assemble. 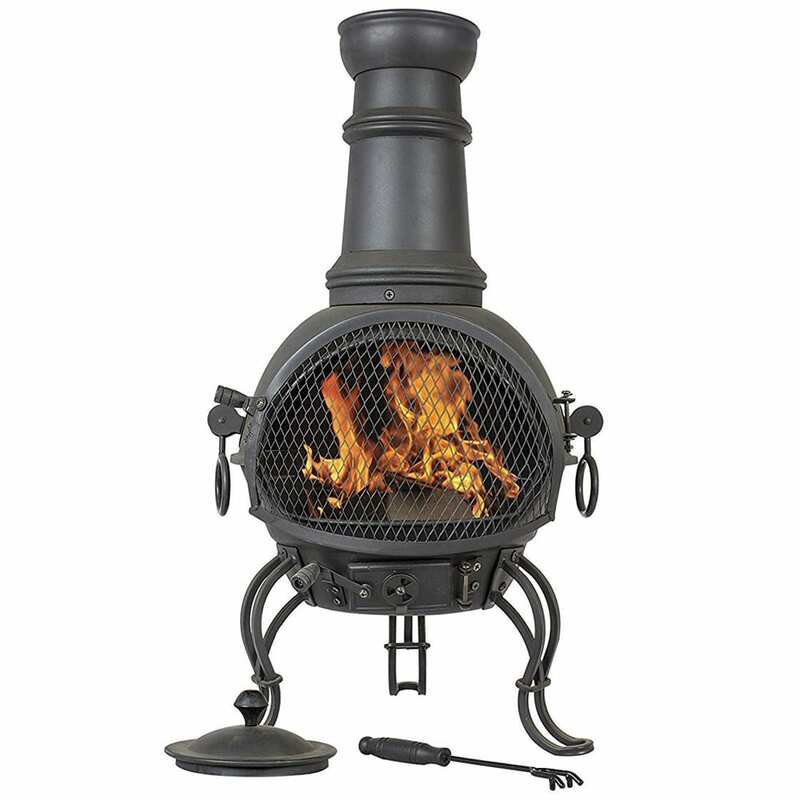 This medium-sized chiminea looks the part with its traditional style and decorative feet. If you’re searching for a chiminea for entertaining and wood-fired BBQing, then this could be just what you’re looking for. Made from steel with a mesh door for a radiant glow, it gives off good heating and has spark protection. This chiminea should tick most of your boxes as it also comes complete with a chrome-plated cooking grill, log grate, a rain lid and a safety tool. On the downside, a few people felt that they were let down because of the thinness of the metal used, thus leaving it vulnerable to dents and damage should it get knocked over. It can also be a little difficult to assemble. Many users said the instructions were far from clear, so you may find this more frustrating than planned. As a whole, it gives great value for money – so don’t be too put off by the negatives. That said, if you’re not into DIY, you might be better off choosing a model that is easier to assemble. When it is chilly, having an electric fire in your home is great when you want to stay indoors. But what if you want to spend time in your garden? That is why choosing the right chiminea is a must. You’ll be able to enjoy the outdoors without having to feel too cold. In this section, we take a look at some of the most important features you should consider when picking a chiminea. Most chimineas are constructed from either clay or metal. Clay is the traditional material used, but metal options (steel, cast iron, aluminium and copper) are becoming more popular. They are a more modern choice. They are available in many different styles and designs, so you should be able to find one to suit any outdoor space. Most will be lighter than clay ones, with the exception of cast iron models. Metal chimineas are also much more resilient and hardwearing; their structure will not crack or chip if they get knocked or topple over. That said, there are also some negatives to consider with metal models. Metal conducts heat extremely well, which means they can become dangerously hot. They are also prone to rust if not protected properly. Also, the outer paint may ‘bake off’ relatively quickly with regular use, depending upon the quality of the chiminea. Clay, especially terracotta chimineas, can make a beautiful addition to your patio or garden. They often boast attractive carved designs or rustically painted patterns which can be a lovely patio centrepiece. The outer walls are also less likely to become hot enough to cause nasty burns should they be touched by accident. On the downside, they are much more fragile and will require more maintenance than metal versions. Hairline cracks will need to be repaired quickly to avoid further damage and the entire body of the chiminea should be treated with sealant regularly to protect against the elements. Clay chimineas are only suitable for burning wood. They cannot burn coal or charcoal as these fuels create very high temperatures which can damage its structure. Lastly, clay ones tend to be heavier than metal chimineas, so they will be more difficult to relocate. The right-sized chiminea for you will depend on your available space and what you’re intending to use it for. If you would like to simply sit around the fire with friends on a cool evening, then any chiminea which will fit nicely into your patio or garden should do. On the other hand, if you are looking for a chiminea that’s great when you host a BBQ, then the size of the fire pit/stove becomes more crucial. In this case, you should go for a chiminea which either includes a cooking grate as standard or has a wide enough opening for you to fit one yourself. The body of the chiminea will have to be quite deep too so that it can accommodate the amount of fuel needed to cook effectively. Safety is a major consideration, especially if you have small children and pets. To limit the risk of injury, you should make sure your chiminea features a spark guard to keep curious kids and animals away from the flames, as well as protect against accidental fires. A clay chiminea is generally a safer choice for children and animals, as the outside doesn’t become searing hot like a metal chiminea. Whether you choose a metal or a clay chiminea, you must first prepare it before it can be used as intended. This process is known as ‘seasoning’. Seasoning your chiminea protects it from intense heat by creating a sooty coating within the fire bowl. To season your chiminea, you’ll need to light a series of small fires and let them burn out completely. Once each fire has gone out, you must let the chiminea cool down before repeating the process. You should do this for around a week before lighting your first large fire. Once your chiminea has been seasoned and is ready for use, you must remember to add fuel gradually while building a fire. If flames start to shoot out of the chimney, the fire is far too big and could cause damage to your chiminea. Take it slowly and give the fuel time to catch before adding more. This way, you are more easily able to keep the fire under control. Each and every one of the chimineas featured in our list will make wonderful additions to your garden. But our overall favourite is the La Hacienda Sierra Chiminea. This stylish and durable chiminea is perfect for all outside spaces, from small patios to larger gardens. It powerfully heats up its surrounding area which is certain to keep you and all your guests nice and warm during chillier nights. The cast iron structure also retains heat incredibly well after the fire has died out, so you can remain cosy for a while longer without needing to retreat indoors. As if this wasn’t enough, it also comes complete with a metal grill, so you and your family and friends can enjoy delicious food without having to set foot in the kitchen. Additionally, it is effortless to assemble and features an easy-access ashtray for simple cleaning when the fun is over. All in all, if you’re looking for a multi-functional and attractive chiminea to enjoy in your garden – we think the La Hacienda Sierra is the best chiminea you can buy.